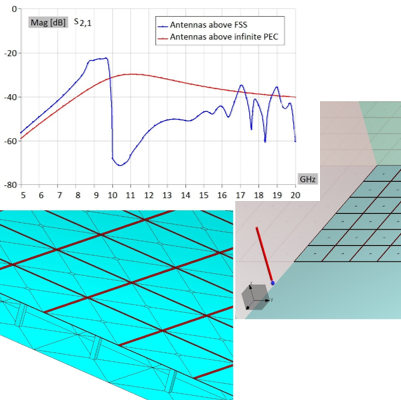 This application note focuses on the simulation of a classical FSS structure by applying the feature “apertures in PEC/PMC plane”. The FFS comprises of large periodical array of mushroom type printed patches, spaced by a narrow gap. In order to emulate reasonable measurement scenario, two antennas are placed a large 32×32 array and excited using TE or TM polarization. The simulation is simplified by applying two symmetry planes reducing the problem to 16×16 array, requiring approximately one quarter of the original number of unknowns. A rather complicated realistic scenario can be simulated on a standard laptop or desktop PC in a couple of minutes per frequency point. Considering the fact that the simulation requires around 33,000 unknowns, the required time can be decreased if a single inexpensive CUDA enabled GPU card is added to configuration and utilized via the GPU solver. The simulation verifies the measured results showing the gap in the frequency band between 10 and 13 GHz. The problem of interest is rather wideband. If the simulation band is narrowed to a 0.5 GHz and simulations performed at 100 frequency points, numerous local resonances and glitches can be observed in the results.